We can't let this forum exist any longer without Synthy talk. Most of my musical life, I've been a Korg man. My first major Keyboard was a Korg 01W/Pro (76 keys). I loved that keyboard, but ended up selling it when I moved across country. I wasn't sure it would survive another move. The keybed was starting to go and I had already repaired it twice before. I've also owned a Polysynth, an M1, a Wavestation, an X3, a Karma and an M3. My real only complaint about Korg is they don't support the keyboards very long after release. They move on to the next thing and leave the old ones in the dust. I didn't keep the X3 for long at all...I traded it towards the Karma. All in all, Korg has GREAT strings, decent brass and up until recently, OK piano. (Their newer pianos are out of this world amazing). I've also owned a Yamaha Cs2 something or another and a Roland Juno G.
I no longer own any hardware synths and have sold them all and went with the Komplete Kontrol S88 and use Softsynths almost exclusively. A good number of my softies are Native Instruments (from the Komplete Ultimate series), though Waves makes a few killer softs as well. My goto piano is Alicia's Keys and The Giant, though there are times and places to use the more inferior pianos found in the Komplete set as well. I also have quite a number of Impact Soundwords softs as well, but my all time favorite of theirs is Shreddage. (Both 1 and 2). What about some of you? I have owned a Korg X2 (76 keys), but traded it in for a Roland JV-1080 rack after I got my first computer with a software sequencer. My hardware is in the closet, and I am addicted to soft synths now. I don't have any NI stuff yet, but I have IK SampleTank 3 and Syntronik, all of the AIR and Sonivox stuff, the SynthMaster everything bundle, iZotope Iris 2, and Tracktion Biotek. I have some free stuff and some demos from u-he. I think that u-he Zebra or Diva would probably be next in line as a synth acquisition. I have some Arturia demos, but so far I am very satisfied with the vintage analog sounds of Syntronik. Never had any money for vintage analog synth hardware, so that is making up for it. Not missing much in the sounds palette, but it is getting hard to find time to dig into it all, LOL! And hard to pick a favorite. I like them all! The first synth I played was an old Juno (can't remember the model) that we used in an 80's cover band, back in the 80's. The first synth I owned was a Casio that had a sequencer in it. I went nuts creating stupid songs in that thing and adding acoustic guitar to the sequence, recording into a cassette recorder. This was around 1986. The next synth I owned was a Kawai K4. I loved that thing. To this day, there are sounds I still can't recreate from it in other synths. After that, it was a long list of sound modules: MT32, SC88, JV-880, JV-1080, Emu ProCussion, MDB-1, JV-2080 and, finally, my last synth, a Korg Triton. I still have a couple of the sound modules in my desk/rack, but I haven't powered them up in well over a year. I've since replaced everything with an S88 and a crap ton of VST synths and samplers. Current go to's are: Omnisphere (on every track I do) and Kontakt. OH my goodness!! I forgot...the first Synth I owned was also a Casio. Got it for a graduation present from high school. I think it was the CZ-1 or something. It had mini keys and a build in 4 track sequencer. I loved that thing until I realized that there were better things out there. I took it apart and added guitar strap hooks to it and used it as a "keytar." My first synth was a Korg Poly 800 with reverse key colours, then made a Transcendent Polysynth which was great for twiddling knobs till my daughter knocked it over and killed it. My midi keyboard is an SY35 with a broken F#3 key, so i record everything in key of Eb! Sold my Wavestation WSSR, but still have an M1R, but far easier to use the software versions. My favourite synths are Trillian, Addictive Drums (far better than the clunky BFD) and Addictive Piano, and next week i'm buying Omnisphere - my sound needs will then be complete! My first synth is the Roland FA 06 I got last year. It's actually a workstation with the Integra sounds. It spends 99.997% of its life as a MIDI keyboard-controller driving VIs. At some point I will likely get a keyboard/controller with more buttons & knobs and set the FA up as a sound module that can also work standalone in hotel rooms. Nice, Bob. Do you by chance use a standalone VST host as well? Or do you just use it VIA your DAW? My first synth was a Roland Juno-106. I loved that thing. Then I found out about MIDI and bought a Yamaha FB01 Module, Yamaha RX21 Drum Machine and a Yamaha QX21 hardware sequencer. I thought it was the greatest setup ever! Later I bought my first Workstation, a Yamaha V-50. It had 4 operator FM and a built in RX5 Drum Machine along with an 8 track sequencer and effects. That's where I developed my understanding of how to put a piece of music together. 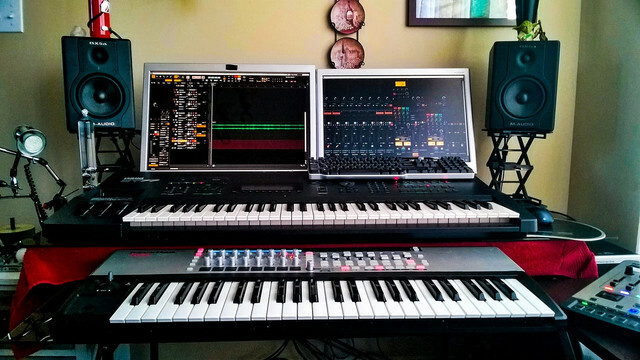 After that, I got a Yamaha SY85 (woo hoo, two workstations), and later an SY77 which I still own. I use mostly VSTs nowadays. That and my trusty Roland GR55 for guitars. It's still hard for me to believe the power in a single laptop with the right software compared to the load of equipment I used to need. Yes... that is Cakewalk on the screen. I've been using REAPER almost exclusively lately, but decided to use CW this weekend. It felt quite comfortable and actually worked flawlessly. (04-23-2018, 12:17 PM)Midiboy Wrote: Nice, Bob. Do you by chance use a standalone VST host as well? Or do you just use it VIA your DAW? Thanks Bob... now I have Monitor envy! (04-23-2018, 04:58 PM)cheap_guitar Wrote: Thanks Bob... now I have Monitor envy! Gosh, and I thought it was a bit on the smallish side! e tu Craig? Now I've got to go monitor shopping. You've got a nice setup going there! (04-18-2018, 12:33 PM)dcumpian Wrote: I still use one 32bit plugin: VB3. The 64bit version of that plugin sometimes gets too noisy and it still has yet to be fixed. Probably never will at this point. Size doesn't matter...it's how you use it. Or something like that. lol. I have Kontakt and a handful of other softsynths, but I don't use them anymore. I have a Hammond XK-3c, a Yamaha MOXF6 and a Casio Privia Stage Piano. I use all of them as hardware outputs and record audio most of the time. occasionally I'll record MIDI, but it's rare. I also use the MOXF and Casio to play live. I've used the XK-3c live before but only a couple of times. it's more than I want to carry around for gigging. My first keyboard was an old yamaha, but I don't remember the model. that was in the 80's. I haven't had it for years and actually don't even remember what happened to it. got lost in one of my moves. I wasn't serious about music back then anyway. but - I love my hardware. I prefer it to softsynths myself, even for recording.